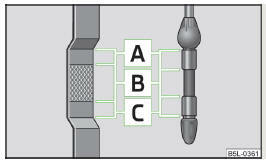 The dipstick indicates the engine oil level » Fig. 128. Ensure that the vehicle is positioned on a level surface and the engine has reached its operating temperature. Wait a few minutes until the engine oil flows back into the sump. Wipe the dipstick with a clean cloth and insert it again to the stop. Pull the dipstick out again and check the oil level. No oil must be refilled. Oil can be refilled. The oil level may lie in range A . The engine must be topped up with oil so that the oil level at least reaches range B . The engine burns some oil. The oil consumption may be as much as 0.5 l/ 1 000 km depending on your style of driving and the conditions under which you operate your vehicle. Consumption may be slightly higher than this during the first 5 000 kilometres. The oil level must be checked at regular intervals. We recommend it be checked after each time you refuel or prior to making a long journey. We recommend maintaining the oil level within the range A , but not above, if the engine has been operating at high loads, for example, during a lengthy motorway trip during the summer months, towing a trailer or negotiating a high mountain pass. The warning light in the instrument cluster will indicate whether the oil level is too low » page 36, Engine oil. Check the oil level using the dipstick as soon as possible. Add oil accordingly. Always check the oil level on vehicles with the 1.2 l/44 kW engine when the engine is cold. Otherwise the measuring result is incorrect und oil could be incorrectly replenished - risk of engine damage! The oil level must never be above the A range » Fig. 128 – there is a risk of damaging the exhaust system. Check the oil level » page 143. Unscrew the cap of the engine oil filler opening » Fig. 126 on page 141. Replenish the oil in portions of 0.5 litres in accordance with the correct specifications » page 142. Carefully screw on the oil filler opening cap and push the dipstick in fully.